Image Impact Plus is an ultra smooth and premium quality white paper and card offering excellent colour reproduction for graphics and images. It is guaranteed for use on all office laser and copier equipment and for offset and digital printing. Image Impact Plus combines a super smooth surface that delivers extremely sharp and well-defined images and text, with an ultra white shade which provides excellent colour contrast for professional documents requiring high definition colour results. 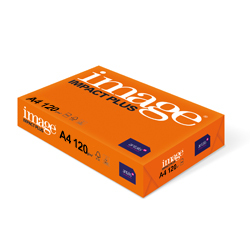 Image Impact Plus is ideal for producing manuals, brochures, flyers, financial reports, invitations, catalogues, posters, banners, photography, booklets and calendars. Guaranteed for full colour printing on dry toner digital, production and desktop colour laser machines. Image Impact Plus is suitable for high volume and duplex printing.